Home Standards What are Standards? Standards outline what students need to know, understand, and be able to do. 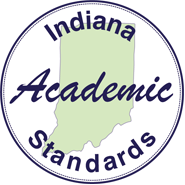 Academic standards are benchmark measures that define what students should know and be able to do at specified grade levels beginning in kindergarten and progressing through grade twelve. The standards are promulgated as state regulations. As such, they must be used as the basis for curriculum and instruction in Indiana's accredited schools. The academic standards are NOT a curriculum; therefore, identifying the sequence of instruction in each grade—what will be taught and how long—requires concerted effort and attention at the district/school level. Academic standards do not prescribe any particular curriculum. Curriculum tools are selected at the district/school level and adopted through the local school board. No student, by virtue of poverty, age, race, gender, cultural or ethnic background, disabilities, or family situation will ultimately be exempt from learning the required academic standards, although it is acknowledged that individual students may learn in different ways and at different rates. Academic standards focus on what students will need to learn in order to be college and career ready and to be competitive in the job market.